Paddle Power Combo | KUMSHEEN | Raft. Relax. Recharge. To settle the debate – Paddle or Power? Great for everyone in your group! 40km, two raft styles, 1 amazing day! From the moment we walked into the gift shop/registration desk to the moment we left we were impressed with your staff. I have become one of your walking ads, sharing our great experience with everyone I work with. This amazing trip moves as fast as the river. Morning to noon you paddle your way to luncheon at Nicomen Falls. You’ve earned it. 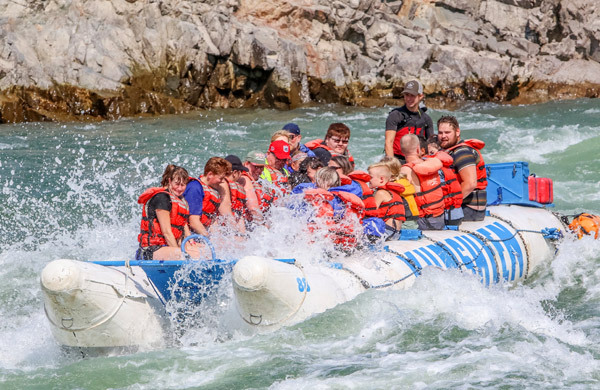 Full to the brim, you board a power raft to tackle the biggest whitewater on the river and blast through whirlpools, boils and huge waves in the Thompson’s Devil’s Gorge. With an impeccable safety record and over 200,000 satisfied visitors, making your way to the Kumsheen Resort could be one of the easiest decisions to make, but leaving could very well be the hardest.